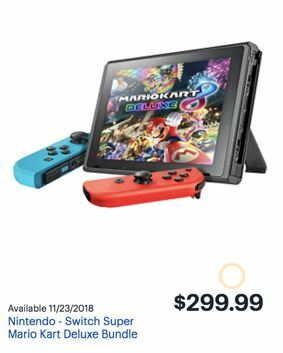 Find Black Friday and Cyber Monday deals for Nintendo Switch bundles and video games in November 2018. We will search the ads of retailers to discover the best discounts and biggest savings on this video game console made by Nintendo. Whether you are considering buying it as a Christmas gift or a gift for yourself, Black Friday 2018 and Cyber Monday will offer a great chance to get the lowest price on the Nintendo Switch this holiday season. 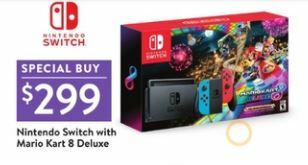 BEST DEAL WE HAVE SEEN ADVERTISED – Click here to get a $50 gift card with purchase of any Nintendo Switch, Xbox One or Playstation 4 system at GameStop. 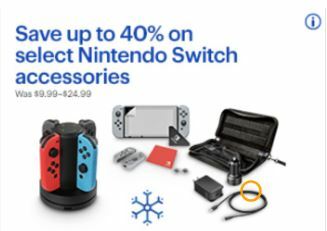 This is on top of their deals, like the $299 Nintendo Switch. Terms and Conditions: Starts Wednesday at 9 PM. Excludes Playstation 4 Spider-Man Bundle and Xbox One S 1TB Minecraft Bundle. Limit One per Customer. The GameStop Deal is LIVE – Click Here for all of the Video Game Systems with a $50 Gift Card. Why does the Nintendo Switch make a great gift? The Nintendo Switch is the hottest video game system on the market in 2017. It is a video game console that is designed for use primarily as a home console with the unit inserted into a docking station and connected to the TV. The unit can also be removed and used as a tablet computer game console or in a tabletop mode with multiple players. This gives it the versatility to operate as a portable game system as well. The Switch supports online gaming through the internet or wireless connectivity with other Switch systems. The Nintendo Switch was unveiled in October 2016 and released worldwide on March 3, 2017. It was known in development by its codename NX. 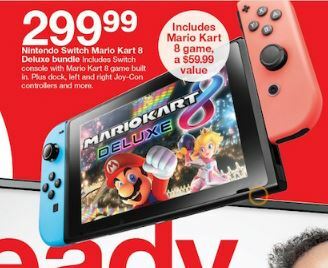 The suggested retail price of the Nintendo Switch is currently $299.99. In a bundle with a video game title, the price is higher. 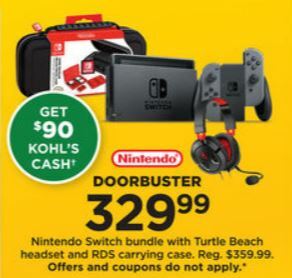 We will list prices here from Amazon, Target, Walmart, Gamestop and others advertising the Nintendo Switch. 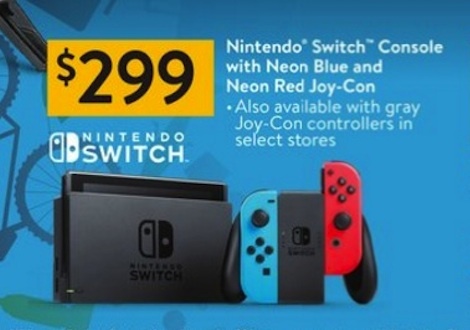 The Nintendo Switch game console is also available bundled with Joy-Con controller and a video game title. We expect that many Black Friday deals will involve a discounted bundle with one or more video games. We will also be looking for any deals and discounts on games for the Nintendo Switch. More than 70 developers were making more than 100 video games prior to the release of the Switch, so there are plenty of games out there to discount in addition to Nintendo’s own games. We will be looking for discounts on some of the top video games, including The Legend of Zelda: Breath of the Wild, Splatoon 2, Snipperclips, Thumper, Mario + Rabbids Kingdom Battle, Mario Kart 8 Deluxe, Pokken Tournament DX, Sonic Mania, Shovel Knight and more. New video game consoles were heavily discounted last year. So we anticipate that the Switch, which will have been out on the market for nearly nine months, will follow a similar path. 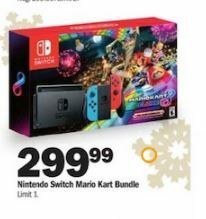 The biggest discount on the Nintendo Switch (standard package, no games) will likely be a $50 discount from the retail price of $299.99 to a Black Friday price of $249.99. This is a fairly standard discount on consoles during the Thanksgiving weekend sales. 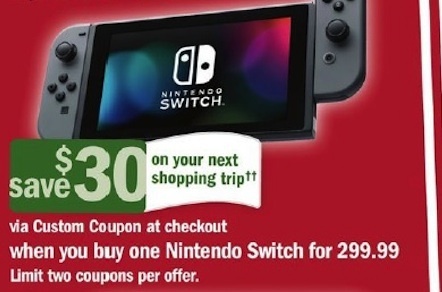 Because the Switch has been out for a number of months, you also may see discounts on used/pre-owned systems from GameStop. Some retailers may opt to charge the regular price but provide a store gift card instead. It will be a few more weeks until we start seeing the first Black Friday ads. We will be adding Switch prices here once they are leaked or released. We encourage you to stop back soon to check out updates to this page. Smartphone Cell Phone Black Friday 2019 & Cyber Monday Deals – iPhone, Galaxy, etc.